While often not associated with the typical West-Coast imagery that comes with reports of earthquake activity, Connecticut has a surprisingly under-appreciated history of seismic disturbances. The majority of significant earthquake activity in Connecticut is the result of underground faults in the central part of the state near Moodus (in East Haddam). 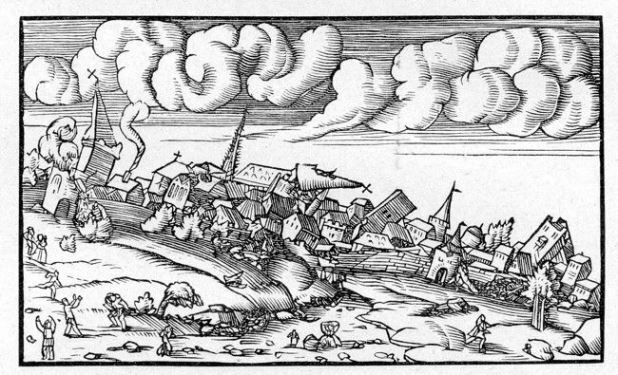 The earliest recollections of earthquakes in the area come from stories related by local indigenous peoples who noted several earth-shaking events around the 1570s and early 1590s. Moodus gets its name from the Native American word “Machimoodus,” which loosely translates to “the place of noises.” The local Wangunk tribe attributed the rumblings in the ground around Moodus to an angry, vengeful god they named Hobbamock. The English Puritans who first arrived in the area (purportedly angering Hobbamock) later theorized the loud, explosive sounds came from battles between covens of nearby witches. After European settlement, reports of earthquakes near East Haddam began appearing every few years. The largest of these events took place on May 16, 1791, when two large shocks and dozens of lighter aftershocks tore down chimneys and stone walls in town. East Haddam is not the only area of the state to feel the effects of Connecticut’s underground instability, however. In April 1837, tremors sent lamps swinging and people running into the streets in Hartford, and a quake that some say sounded like “carriages crossing a bridge” struck New Haven around 10:45 pm on June 30, 1858. The largest quake measured in Connecticut after the May 1791 earthquake occurred on November 14, 1925, near Hartford, and literally thousands of shocks and microquakes have spread throughout the state over its history. The area around East Haddam, however, became a center for scientific study after a 3.5 magnitude quake shook the area in 1968. Six years later, scientists opened a seismic monitoring station in Haddam. It was the first of what eventually became six stations developed in the area. The new stations paid immediate dividends when a swarm of microearthquakes erupted in August of 1981. Starting with two small shocks on August 2, the area experienced over 500 fault-shifting events over the next three months, rattling the homes, and nerves, of local residents. Hundreds of unsettling quakes then followed as the swarms of activity returned in 1982, 1987, and 1988—the most powerful registering a 2.3 on the monitoring system. Since the swarms of the 1980s, the surprising prevalence of seismic activity in central Connecticut has shown little sign of stopping. A large “boom” sent firefighters near Moodus scrambling to find the source of an explosion in March 2011 before reports came in attributing the noise to a powerful underground fault shift. Another swarm of small quakes occurred in January 2015, once again focusing the attention of seismologists on the ground regularly shifting underneath the feet of Connecticut’s residents. “Connecticut: Earthquake History.” United States Geological Survey, 2014. Link. Rierden, Andi. “A Steady Observer for Trembling Moodus.” The New York Times. August 6, 1989, sec. NY / Region. Link. Hesselberg, Erik. “‘Moodus Noises’ Strike Again: Small Quake Shakes East Haddam Residents.” Hartford Courant. March 24, 2011. Link.